Iris Crane's tranquil life is shattered when a letter summons memories from her bittersweet past: her first love, her best friend, and the tragedy that changed everything. Iris, a young Australian nurse, travels to France during World War I to bring home her fifteen-year-old brother, who ran away to enlist. 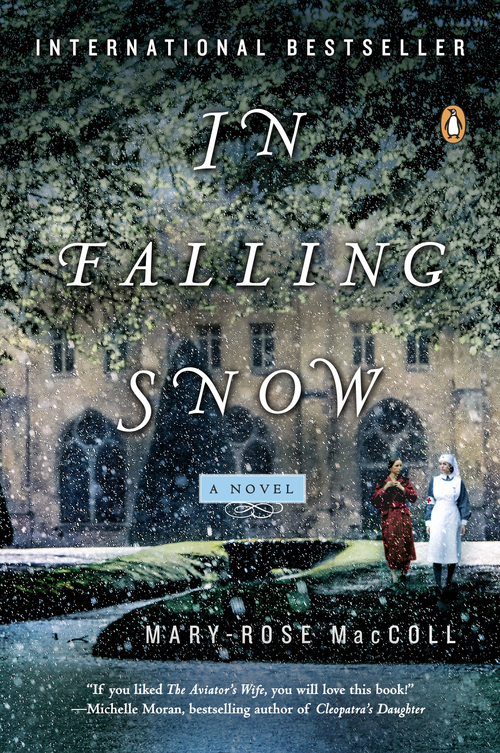 But in Paris she meets the charismatic Dr. Frances Ivens, who convinces Iris to help establish a field hospital in the old abbey at Royaumont, staffed entirely by women - a decision that will change her life. Seamlessly interwoven is the story of Grace, Iris's granddaughter in 1970s Australia. Together their narratives paint a portrait of the changing role of women in medicine and the powerful legacy of love. Estelle from Rather Be Reading recently tweeted me with a link to In Falling Snow and asked if I'd heard of it. I had to laugh when I saw it because I was actually reading this book at that exact moment. I loved that she knew this was a book I'd be drawn to without any idea that I was currently in the middle of it. I wasn't sure what to expect from In Falling Snow. I haven't read anything by Mary-Rose MacColl, and I've actually read very little historical fiction set during World War I. A quick glance at the summary had me intrigued, but I honestly didn't realize that it was about a field hospital in France that was run entirely by women. Royaumont, the hospital, was a real place - an old abbey that was converted to a hospital during the war. The doctors, drivers and nurses were all women, and they ran an efficient hospital as an extension of the Scottish Women's Suffrage Federation. 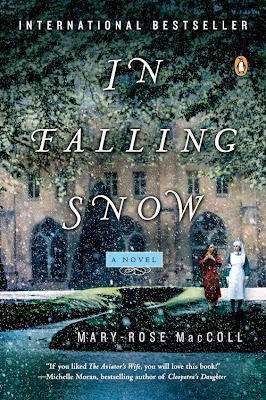 In Falling Snow is told from the perspective of two different characters - Iris Crane and her granddaughter, Grace Hogan. It takes place during two main time periods, 1916-1918 and the 1970s, and in two places, France and Australia. Iris Crane and her brother, Tom, are growing up in Australia with their father. Their mother died after giving birth to Tom, and it was just the three of them for years. Iris became like a mother to Tom, which is why her father sends her to France when, at fifteen, Tom runs off to fight in the Great War. Instead of doing what she's told, she ends up at Royaumont after a chance meeting with one of the doctors at a train station. It's a decision that will change her life. Fast forward almost sixty years, and Iris' granddaughter, Grace, is a obstetrician and the mother of three. She's struggling to juggle her family and her career, in addition to the health of her aging grandmother. Iris has recently received an invitation to an event commemorating Royaumont, and it brings back a flood of memories. Iris drifts from past to present - reliving some of the best and worst moments of her years in France. She wants to travel back to France, but Grace feels that Iris shouldn't go alone. There's some tension between the two, and the book works toward unraveling the secrets at the foundation of their relationship. One of the only things I didn't love were the shifts between the two narrators and time periods. I've read a lot of historical fiction that uses this method to tell a story, and I think it's often really effective when trying to build a sense of mystery. There are a lot of secrets in Iris' past, and each flashback leads to the culmination at the end about what exactly happened in France that's left her still scarred to this day. There are scenes from 1916 France and 1970s Australia with Iris, and then additional moments in 1970s Australia with Grace. But there are very short episodes set in 1918 with no defined narrator and unnamed characters. I think it was done this way to heighten the sense of the secrets being kept. Those are the scenes I found confusing, and I found myself flipping back on my e-reader to try and make sense of them. However, this book is rich in historical detail. The setting was vibrant and interesting - I loved all the people who worked at Royaumont and being able to see these women build something that would leave an incredible legacy. I learned things about World War I that I never knew before, which I always appreciate in historical fiction novels. Iris' best friend at Royaumont, Violet Heron, is an interesting character but I thought she was somewhat underdeveloped. Iris hints at things about Violet, her personality and her past, that never really receive further attention. It's like these little references to some hidden pain, but there's never any closure as to what it might be. I did love that they called themselves "the flower bird girls" for their unusual names (flowers for the first and birds for the last). Violet was brave and unflappable and, in many ways, an even more intriguing character. I really wanted some more from her story! I enjoyed the two main characters, but I did find myself favoring the time spent in France. I wanted more of Royaumont with Iris, Tom, Violet and the rest of the nurses and doctors because those were the aspects of the book that I found most interesting. I liked Grace's story, too, but I also found her to be a really frustrating character. I wasn't that interested in her story, despite its connection to Iris' past. However, I still really enjoyed this book! I haven't read anything quiet like In Falling Snow, and it highlighted a number of aspects of war and medicine that I hadn't learned about before. I feel like I haven't said anything about the plot, but that's mostly because it really hinges on the slow unfolding of the mysteries of the past. I found Royaumont interesting, the women who ran it admirable, and the story of love and sacrifice to be ultimately uplifting. "We are not warriors here, just pieces of meat to put before guns." "We knew them just a little, but every one of the millions killed in those four years was a life surrounded by others that would never be the same. So that when you took that one life, you took others and the casualties ran on and on until there was nothing left but grief. It ran like a river through every small town and city of Australia and the world. And for what?" *I received this book from Penguin Books in exchange for an honest review. I was not compensated in any way for this review. I've never heard of this but it sounds pretty good! You seem a little on fence so what do you think for me? Yes read or no read? I haven't read any historical fiction set in WWI either so I'm always intrigued to read about a time period I don't know much about. This sounds like such an intriguing book! I had no idea that Royaumont existed in real life. That alone is enough to peak my interest in this one! I know, right? I have no idea a place like that existed - and I KNEW I wanted to read it for that reason alone. I really enjoyed that aspect of this book!